In the 13th century, diamonds were first cut to improve their look. Prior to that, the crystal's edges were smoothed down and the flat surfaces polished. The first cut was known as the "table cut" The octahedral(eight sided crystal structure of diamond) crystal was given a flat surface on top(known as a table) and a smaller flat surface underneath which came to a point(known as a culet). In the late 1400s, the cutting wheel was used and diamonds started to get their quality attributes as we may be familiar with today, but still not quite near the geometric precision in todays round brilliant cuts. In the early 1600s, the rose cut was introduced as an economical way to cut flat diamond rough. At this time, diamonds were becoming more and more precious to the aristocrats of the modern world, hence, yielding top dollar. In turn, dearness of the value was much greater, so naturally, cutters wanted to waste as little rough as possible, if any at all. The rose cut had a faceted dome and flat base under which at this time, gold or silver foil could be placed to reflect light, giving the sparkle and intense fire that is so coveted today. The Kelly bag is a classic that will never go out of style. It is one of those basics, like the little black dress, that should be in every girls closet. I prefer mine in black patent, but there are so many colors and styles to choose from that you could have the perfect matching Kelly Bag for every outfit in your closet. But where does the term "Kelly Bag" come from? or better...why is that styled called a Kelly? 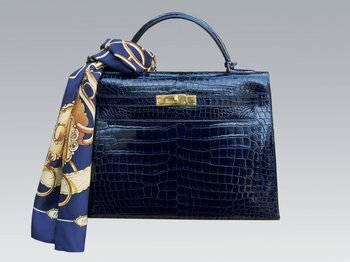 The bag was first introduced by Hermès in the 1930's. Hermès has long been famous for its fine handmade leather luggage and handbags. 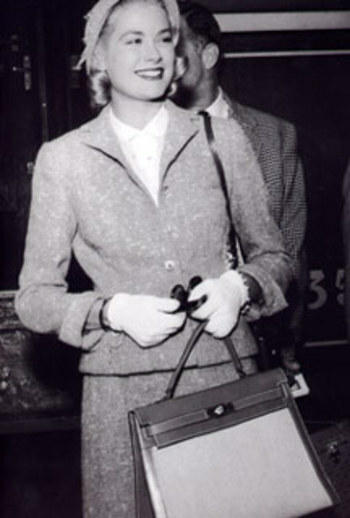 In 1956 Grace Kelly was photographed in the pages of Life magazine carrying this now famous bag. The style was quickly nicknamed the Kelly Bag. 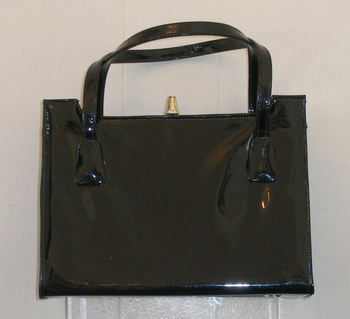 It is rumored that Grace Kelly carried this style of bag to hide her pregnancy. She was photographed on many occasions after the pictures in Life carrying a Hermès Kelly Bag. You can still see many fashionistas and stars of today carrying the same bag that Grace Kelly made famous in 1956. You don't need to shell out the big bucks to pick up an actual Hermès. 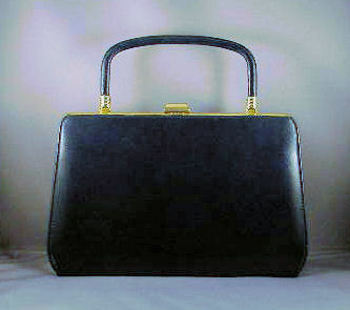 You can spend allot less and still get a fab vintage Kelly Bag. I decided to post a quick recap of one of my post popular post on my former blog. This is a post about some of my favorite reference books. This is a question I get often in my shop...so here are a few of my favs in a post I did a while back. I was going through my bookcase last night searching for a book to do a quick reference on a piece I was working on. I realized that I always seem to grab the same few books first when hunting for info and others might be interested in which books I find most useful. So, here is a list of the books that I find myself using most. There might be other great books out there, and I'd love to hear about them. Collecting Costume Jewelry 101: The Basics of Starting, Building and Upgrading by Julia C. Carroll – This is a great book for designer information. It gives a quick overview of many of the most popular manufacturers including operation dates and buying guide. A 202 version is out and offers even more great info on helping date jewelry with lots of awesome copyright info. The 202 version is a little more in depth and I recommend the 101 first. Answers to Questions About Old Jewelry: Covers 1840-1950 C. Jeanenne Bell – This book seems to be a standard among collectors. It's a large book with lots of info like makers marks. There are different versions of this book…so make sure you pic up the latest version to get all the updated info. Warman's Jewelry (3rd Edition) by Christie Romero – As with Ms. Bell's book, there are other versions of this book available…so make sure to pick up the newest edition. I purchased this book directly from Ms Romero online and she sent me an autographed copy and a bonus companion book. I was also able to start a great e-mail conversation with her as a result and learned a few great tidbits. I also took a 2 day "boot camp" on vintage jewelry taught by Ms Romero and was able to see allot of the jewelry in the 3rd edition in person. It was fantastic and if you get the chance...take the class!! How to Be a Jewelry Detective by C. Jeanenne Bell – This is a great book that I find comes along with me when I go to buy. It's small enough to fit in my bag and has great info for quick reference. Not only does it list patent numbers and their corresponding dates it tells you how to test jewelry. She also includes a fun quiz at the end to test what you have learned in the book. Secrets To Collecting Jewelry by Leigh Leshner – This book is new to my collection, so I have not had a chance to fully explore it yet. It does seem to be a great book that feels much like an encyclopedia of jewelry terms. I am looking forward to getting a chance to use this more. Those seem to be my most used books. I am always on the lookout for other great vintage jewelry, clothing, or accessories books…so maybe I'll add to the list when I find some more great ones.